The MV Priscilla cargo ship has arrived in Scapa Flow after it was refloated in a successful overnight salvage operation. The 292 foot cargo ship ran aground on the Pentland Skerries off Caithness over a week ago, causing a headache for both boat owners and the marine authorities. After a number of attempts in the last week to bring the Priscilla off the coast a fresh effort started at around 9pm on Wednesday evening. The ship was finally freed at high tide at about 10pm and from there was taken to the “safer waters” of Scapa Flow in Orkney. Its condition was deemed safe enough for the journey and it arrived at a safe anchorage at some time before 2am yesterday. A Coastguard spokesman said: “The MV Priscilla remains stable and safely at anchor within Orkney Harbour’s jurisdiction of Scapa Flow. MCA surveyors are onboard assessing the vessel and a dive inspection is still ongoing. 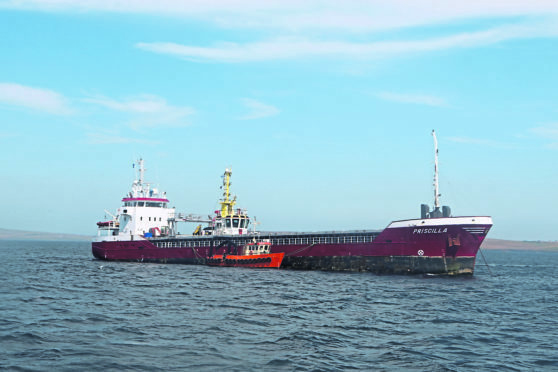 Before the refloating operation began, two salvage companies – Multraship and Ardent – and the ship’s Dutch operator Wagenborg removed 28 tonnes of marine gas oil from the vessel and removed the cargo of fertiliser. The crew of the Priscilla remained on board throughout. Longhope lifeboat was tasked by the Coastguard with escorting the cargo vessel and tugs to a safe anchorage. A statement by the RNLI Lighthope read: “The Dutch registered vessel Priscilla, carrying a cargo of fertiliser, ran aground about five nautical miles north east of Duncansby Head in the early hours of Wednesday morning 18 July. “After several failed attempts to refloat it, the vessel has been stranded on the skerries until now. There appeared to be no major damage or a threat of pollution. The Marine Accident Investigation Branch (MAIB) confirmed that a probe into the incident has started.